"When you've had enough Mr. Turner you say 'when'." I'm saying 'when' to something that was started to bring people together, to connect us to each other has sunk to a level of degradation. What started out as a friendly vein of filaments is becoming nothing more than an unfriendly, heartless hub to the desensitized society of the social network. How easy it has become to blatantly comment on a screen, that inanimate object, without heart or soul. How quickly we have become a network comprised of many who forget or chose to ignore that they are connected to their fellow man, a living, breathing human being. It's sad days as I've tuned in to my social network page and seen things that are hurtful and insulting, things that are degrading, things that make me mad but also things that lower the dignity and offend my family and friends. Certainly, I am not a perfect person, and I've never claimed to be one. But, just as certainly, I am not a mean person. It's not kind to say whatever you want and never take into account the other person's feelings. It doesn't make anyone bigger to make someone else smaller. It's bullying to beat someone down with a gavel of rude and malicious gaggle. 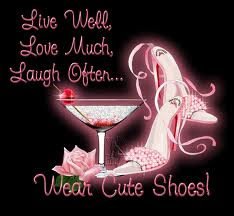 I love people and I have many colorful friends from all walks of life. They include left wing, right wing, richer, poorer, gay, straight, Christians, Atheists, Agnostics, Muslims, and Jews. I have friends that straddle the fence. And that's okay because sometimes I'm on that fence with them and the view from there often takes in a farther reaching perspective. But I'm saying 'when' to the ceaseless political rants, the degrading memes, the ugly, malicious insults, and to those who have nailed someone to the cross for their own agenda or because someone holds a different point of view. Honestly, I don't know where they find the time. I am too busy muddling through the pain and adversity of my own life, and beating down the stress and uncertainty of tomorrow to waste my precious free moments on divesting the individuality of others. I have no power over any one individual to sway or shame them into being kind and considerate of their fellow man. But I can be true to my God and myself. I can say 'when' to what is not love! I can continue to follow Jesus Christ, to love God with all my heart, soul, and mind and to love my neighbor as myself. My life will continue to be open to those who desire my friendship. I will pursue love, kindness and equality for humanity. I will take care of what is mine and share as much as I can. I will be thankful for God's green earth and all that is in it. I will enjoy the talents and gifts He has given me and I will love! 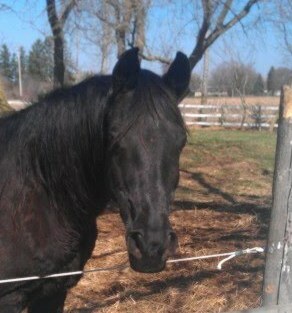 The passing of my Arabian horse, Shafi Halim is heartbreaking for me. 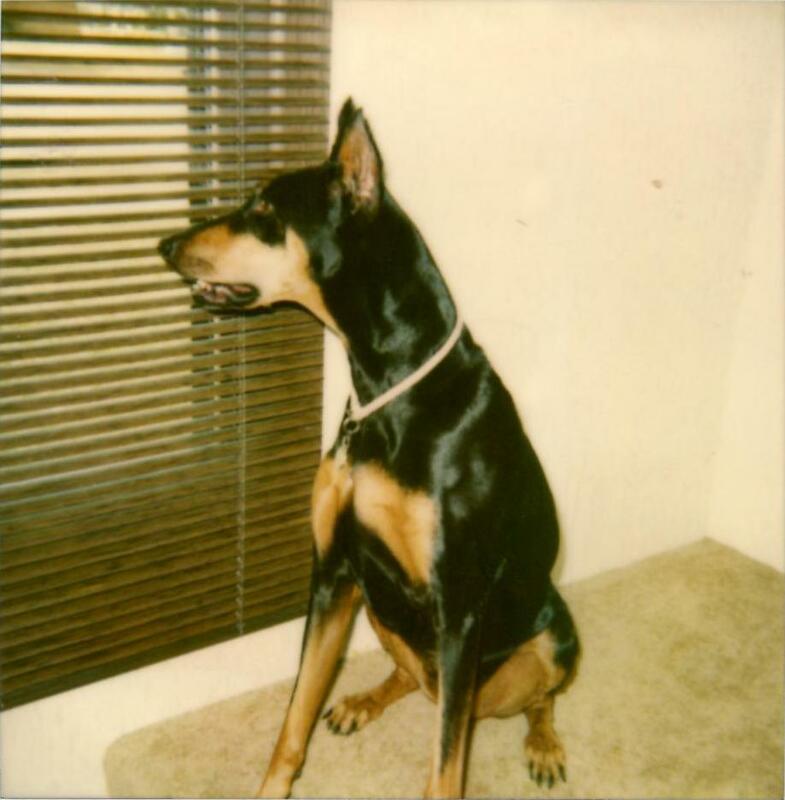 He was a part of my life for over twenty years. 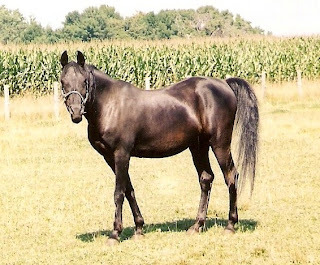 Neither words nor pics can describe the amazing horse he was or the joy he brought to my life and the sadness I now feel. "I create thee, Oh Arabian. To thy forelock, I bind Victory in battle. And a Treasure in thy loins. to be loved by a little girl. Let a horse whisper in your ear and breathe on your heart. 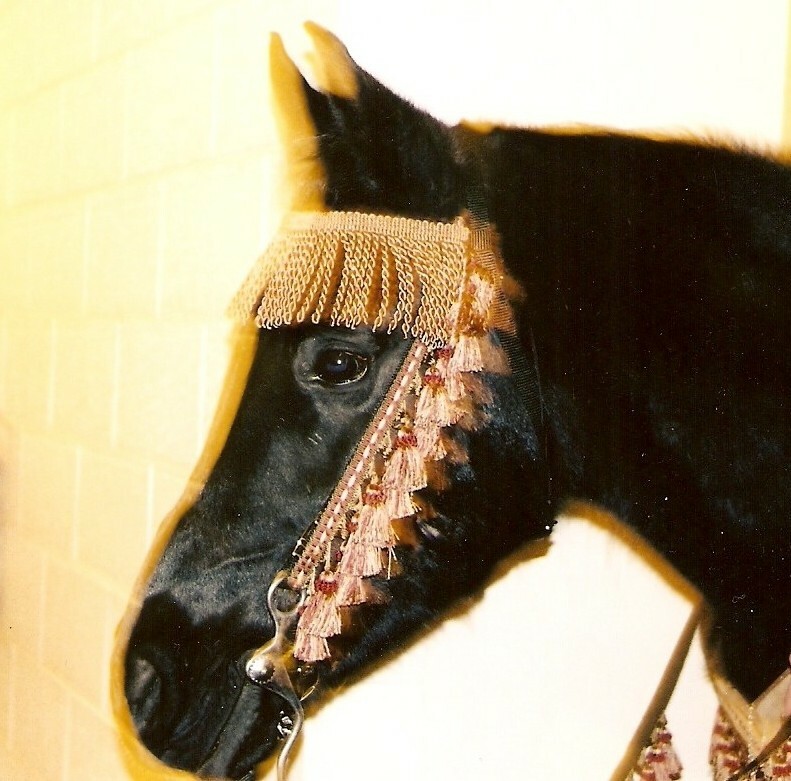 In the steady gaze of the horse shines a silent eloquence that speaks of love and loyalty, strength and courage. It is the window that reveals to us how willing is his spirit, how generous his heart. You took me to adventure and to love. We two have shared great joy and great sorrow. 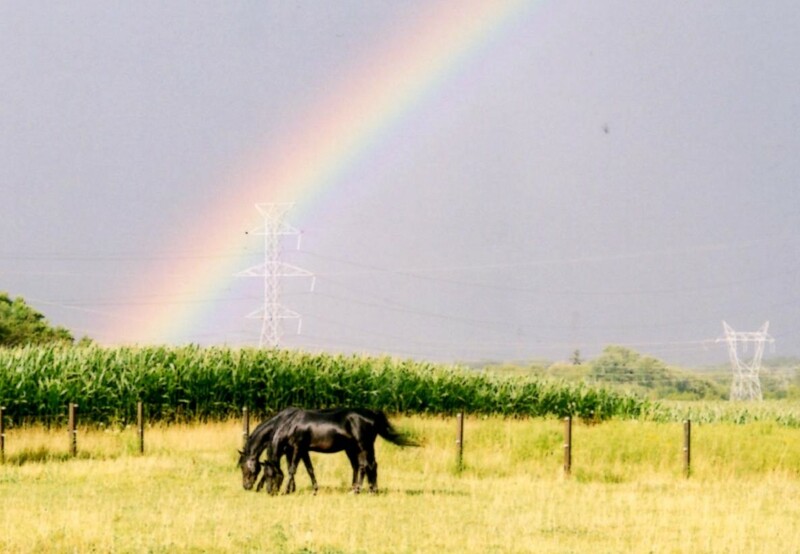 And now I stand at the gate of the paddock watching you run in an ecstasy of freedom, knowing you will return to stand quietly, loyally, beside me. A lonely bow sits in a corner wishing for a brightly colored package to crown. Garland droops in sadness and ornaments hang their heads. Holiday cheer that warmed the house is now ember memories. Sons and daughters are kissed goodbye, released from a warm embrace to fly away. Such is the twilight of Christmas. 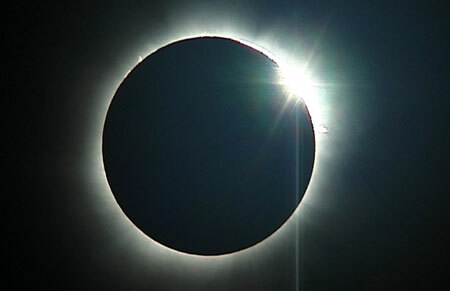 I await the dawn of a another year in an eclipse of a new beginning shadowed in an ending. Sadness ebbs and the familiar feeling of loss flows in quiet tears while the apex of hope peers over the edge seeking a bright future. Wishing you all a bright and Happy New Year!! As is the norm in our century-plus old farmhouse a two hour project often takes up the whole day. Such was the case when hubby and I installed a new ceiling fan with light. We struggled and laughed, got frustrated, and stepped out of the clamor more than once to refocus. At the end of the day the fan was finally connected to the power source and firmly mounted to its support. I flipped the 'On' switch and watched as the blades happily twirled on the base. An added bonus were lights that no longer flickered with every gyration of the whirligig. But the best part was the sound of silence. Instead of a rickety-racket rotation the only feedback was a serene hum. As I stood there admiring my handiwork my mind searched for the last time I tuned in to the sound of silence. In this technical age we are surrounded by modern noise. Sirens and signals scream at us. Traffic jams in our head. Cell phones call us to attention. Larger than life flat screens blare across the room and music blooms from tiny buds in our ears. The sound of silence is deafened by noise. In addition to this daily commotion we will also soon suffer from what I call holiday tinnitus − the ringing of the busiest season of the year. Holiday tinnitus causes silence to compete on two levels. Not only with our media mania but also with the very season that is meant to bring quiet moments of reflection, thanksgiving, and peace. With the added cacophony of gobbling turkeys, Black Friday, and silver bells, we chance becoming dull to the din around us. We drown out the silence of a leaf dropped from the hands of a maple and become numb to the pure quiet of wax running down the side of a candle. How do we arrange a silent bouquet in this arose such a clatter? Try snipping off those distractions that deafen the sound of silence; for example, the television, computer, and ipod. Disconnect from your routine. Step over to the other side of prayer and just listen. Grab a notebook and write what you hear. You might be surprised to find that in the absence of noise there is serene feedback. When we consciously snip back the thorny distractions of our lives and step out of the clamor into the quiet presence of God. He is there waiting for us. When we stop long enough to experience the sound of silence He will speak. The voice we hear in the absence of noise will encourage, inspire, and heal us. We will find our-self connected to the power source that will support us even in the rickety-racket rotation of life and the ringing of holiday tinnitus. When my feet hit the floor my internal temperature guide immediately told me it was a crisp September morning. It was the first of the season. The leaves on the trees were still green, and the grass was still a faded funky color from the dry summer. In the east the early dark clouds formed a line of peaks that reminded me of the Rocky Mountain skyline I saw many years ago. It was Labor Day weekend and while many were tying up the ends of their summer vacations, or enjoying the last of their cookouts I was intent on laboring to finish up summer projects and chores. Hubby had to work the car lot because their Labor Day sale was in full force. So, like many other daybreaks it was the usual routine. But even in routine every once in a while something comes along to make a mundane morning something more. That morning as usual my tiny canine fur ball signaled her need to use the Pomeranian potty so like every other dawn I scooped her up in the palm of my hand and set her gently on the front lawn. When I looked up I saw a bicyclist making his way down our country road. This was no ordinary cyclist, or rather he was an Ordinary cyclist. Yes, you read me write. I mean right. Now I'm confused. Was he ordinary or wasn't he? Okay enough play on words. That particular cyclist was riding an Ordinary and he was dressed the part. With short trunks and knee high stockings, old fashioned button shoes, and a vintage sweater it looked as though he had just pedaled his way out of an eighteen hundred something photograph. The image he evoked was a pleasant scene definitely out of the ordinary. I paused on my front porch taking in the impression of a time gone by. Perhaps it was an occasion when one might have enjoyed more of the simple pleasures, like the unfolding of a rosebud or the peaceful lull of a Mourning Dove's coo. 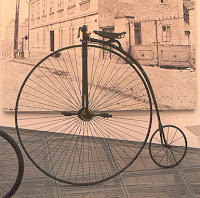 A period when handlebars were mustaches and the only bustle was on the back of a woman's dress. It was a season of ballgowns and grand hotels. A tea-time lingering of friends. Possibly it was a time when we could ignore time. When we could forget for a little bit that we reside in a grown up world of schedules and routines. For a few moments I stood somewhere in time, wrapped in the simplicity of an era of afternoons in the park and the clip clop of horses hooves on cobblestones. 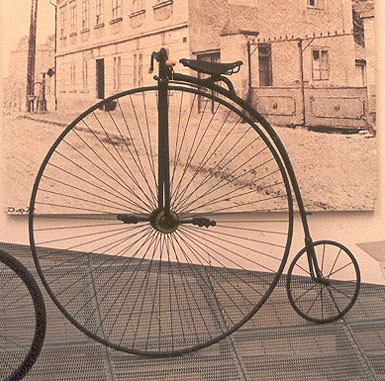 In a wrinkle in time I let the cares of my day wheel away with a penny-farthing cyclist on a high wheeler, and I was thankful for just an Ordinary morning. It's a refreshingly beautiful day after a stretch of intense heat and I am sitting on my porch swing enjoying the balmy afternoon breeze. 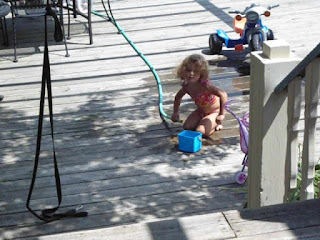 All decked out in her brightest swim suit and playing on the deck is my youngest grandchild Maggie. Her blond, natural curls are more tightly wound from the humidity of the past few days. The outside spigot is turned to a sizable trickle and there is enough water for her to repeatedly fill and empty her tiny turquoise bucket. Occasionally she bends forward to sip the ice cold water snaking through the faded green hose, well water that runs deep within the earth on our three acre plot. I had the joy of watching Maggie grow for the past year and a half. But in a few days she will be off with her mother to start a new life in California. I am already feeling the familiar deep sadness of parting. Saying goodbye is never easy for me. Whether by death or a new life, moving across town or leaving the country to live in a tropical paradise, each parting holds its own melancholic circumstance. The former days of 'goodbyes' quickly hoist the main sail and set me on a course toward nostalgia. I miss my own babies and waves of memories crash upon me. Suddenly I am washed up on the shore of the 'other' house. There my family spent endless hours in our swimming pool. City living in the August heat with no air conditioning made us all thankful for that round pool of water. Sometimes we would swim until midnight to cool down before bed. Summer Sundays after church were almost a regimen with the kids enjoying their dad's secret recipe hamburgers on the grill and swimming all day. Once he made a giant burger. I still can't figure out how he flipped it without breaking it into pieces. I remember one morning I found a small hole in the pool wall. I imagined the worst when I discovered a bullet at the bottom of the water. To this day I am still grateful none of my babies were swimming when that 45 was fired. That experience was the biggest reason we sold the 'other' house. An old gray stockade fence outlined our tiny back yard edged with flower beds. My only son plucked those flowers from their bed to give a tiny bouquet to his kindergarten teacher. 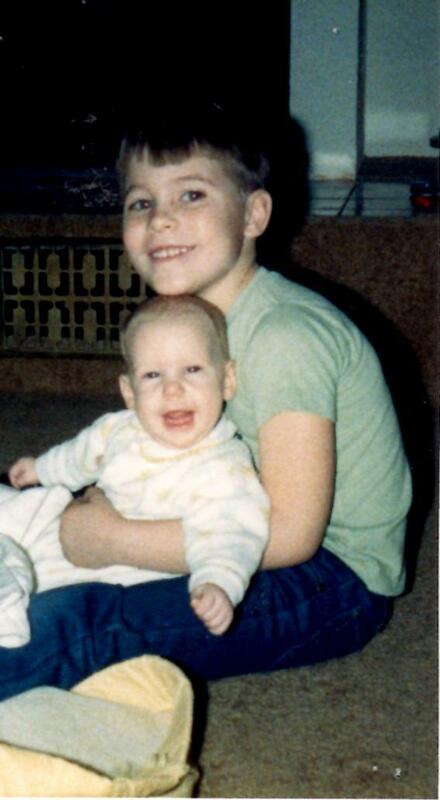 When his baby sister was born he took a picture to show Mrs. Margis and a bully on the playground ripped it out of his hands. David punched him right in the nose. 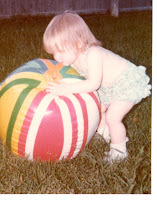 An audience of daisies and lilies watched as my little Theresa and I played catch with a beach ball nearly as big as she was. The magnolia tree that was a Mother's Day present flowered twice in one summer and a lilac bush in the corner became a fort for David and Rachel to spy on the neighbors. In that yard we designed and built a wheelchair ramp for our oldest daughter, Sharon. The ramp became a sledding wonder in winter. 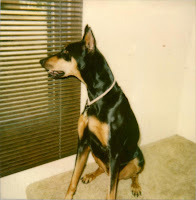 Once, our Doberman Pinscher, who thought my children were her children, jumped over the aged, weathered fence to protect them from a fight between opposing school students. The most special Christmas Eve at the 'other' house was when Theresa was born. She was my joy baby. 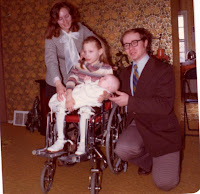 After the trauma of Sharon's birth and all the hardship that followed, I spent seven years questioning, grieving, and living with the fear of another 'bad' doctor delivery. But Theresa's birth was natural, uncomplicated and pure joy. That night in the hospital they brought her to me in a bright red stocking. Santa couldn't have picked a better gift! The saddest Christmas Eve was after my father-in-law passed away and I saw the pain and loss in my children's eyes for the grandpa they loved so much. 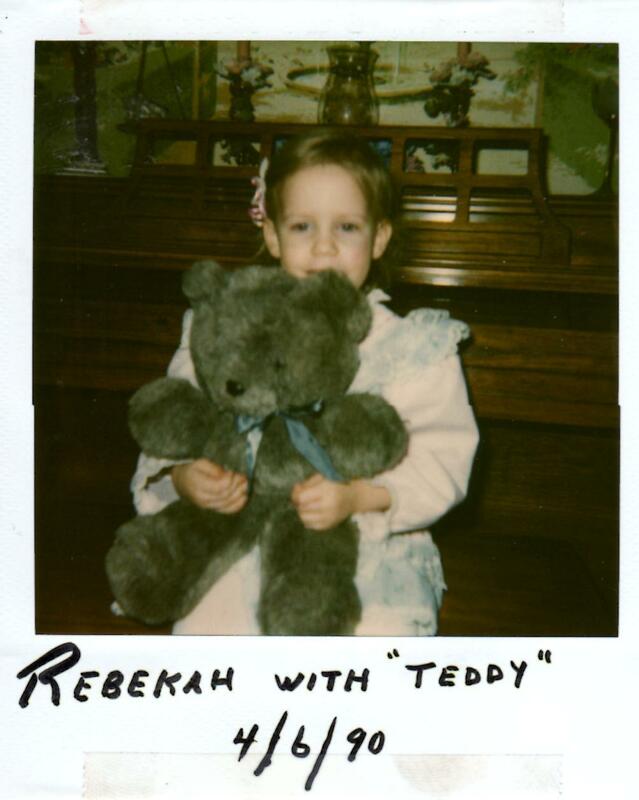 The last of five children, my baby, Rebekah, was born at the 'other' house. She was my healing baby. My mother passed away and on top of that I was deeply hurt in the church we were attending. When Bekah was born, I needed her as much as she needed me. I remember the day she was knocked off her bike by a neighborhood bully. He ran over her fingers and she had a bump by her left eye. The police officer who answered my complaint gave her a teddy bear for being so brave. 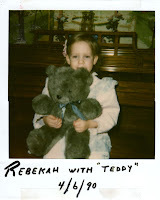 Teddy was part of the Bear With Me program set up for children in crisis situations. Bekah's crisis was minor but I appreciated Officer Freeman's compassion. Hubby and I literally saved our quarters at the 'other' house to build a one car garage. Whenever we had a few spare dollars we converted them to quarters and dropped them in a huge glass piggy that took up a corner of our bedroom. We often stockpiled our glass deposit Pepsi bottles to get our quarters back just to feed piggy. Eventually the garage was built and our little Rachel pushed her nose up against it in a pout more than once. One winter a giant heater kept that garage warm while Rick and I painted a sign on my father-in-law's old work van that we inherited for our business, "Mokry Carpet Service". The kitchen in the 'other' house was small but we managed to squeeze all seven of us around the table for dinner. We had a patio door to the backyard which made the little mess hall feel bigger but our driveway was the only view from the side window. That landed a memory the day my blond haired little boy stood there singing an ode to the big, yellow sun. Even at the tender age of three he revered its warmth. It's no wonder to me now that he has chosen to live in Brazil. Before we finished the basement in the 'other' house the sewer backed up and destroyed pictures, journals, yearbooks, and other sentiments. I cried while I mopped up the stale water and sopping mess. After some repairs I dried out the basement and my tears, then built a giant pink bedroom and a bathroom for our girls. Sharon loved the independence of the new back door with remote opener, and an electric lift on the basement stairs so she could have wheelchair access. Theresa, David, Rachel, and Rebekah found hours of entertainment using the lift as a carnival ride. We still laugh about the time their dad and I raised the lift and trapped them in the basement and David scaled up and over it to free his sisters. I remember the last bittersweet summer in the 'other' house ended with a For Sale sign crowned with a big red Sold. Sweet water memories were washed away with the pool the new owners didn't want. A giggle of Maggie's laughter pulls me from my nostalgic journey and I return to 'this' house. A 130 year old homestead that houses its own memories. Good, bad, tragic, sad, funny old memories. Memories as deep as a well, pulled up in the watery bucket of my mind to be poured out for my children and grandchildren. Because some day they might sit on their own porch swing and journey back over their life in the 'other' house or 'this' one where well water runs deep. It was 3:45 am on the morning of February 19, 2004. That was the as time I arrived at the airport to make the flight to Atlanta, and from there onto El Salvador. 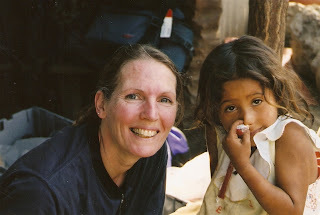 It was my first missions trip as well as my first trip out of the United States. Leaving the freedom of America to arrive in a country where guards stand ready with rifles was disturbing to say the least. I handed my passport over to the customs official and was struck with the gravity of giving away the little book that held my American identity. Then I glanced down at his desk and saw a tract. The official looked up and our eyes locked. Speaking English with a heavy Spanish accent he asked, "Are you a Christian?" Without hesitation I answered with a smile, "Yes, I am." To my delight he said, "Me too!" In that moment God erased any fear and uncertainty that marked my heart. I knew I was in the right place at the right time with my Righteous Companion. Boarding a bus I left the city streets lined with open markets and traveled through green and luscious country. Flowers and plants sown together quilted the land while giant parasol palm trees shaded the countryside. Inactive volcanoes were mountains that had blown their tops, and tapestry rock walls hung like draperies. The beauty that surrounded me made it hard to believe the country housed such poverty. Shanties made from tree posts and ribbed steel marred the landscape. Some hung precariously on the crags as if bemoaning their tenants to onto life by their fingertips. The inhabitants were people too poor to buy even a candle to light their house at night. 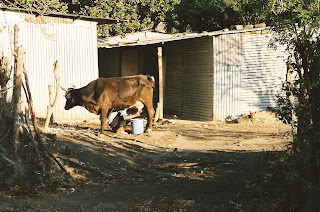 Amidst this poverty I was grateful for the missionary directing my team. He was a big Norwegian with a bigger heart and a delightful character. He loved the people he served and considered the country of El Salvador a book of tales to tell. With five languages under his belt and a wealth of knowledge he told grand stories. But the story he told about the children was the most heartbreaking. Seeing them in his words changed my life forever. I wept when I heard about the dirty, lice infested, and hungry little waifs without homes. More than 400,000 children were orphaned or unwanted. They lived in herds like animals and fended for themselves. They survived on what they could find and dug in garbage heaps to fill their hungry bellies. Right then with God's help I was determined to make a pocket sized difference in the few short days ahead. 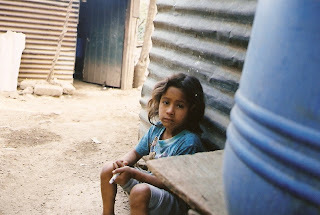 My team's job was to build small houses made of block in a dirt poor, mountain community. 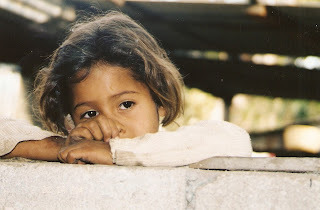 There the children would shyly peek over the small wall that housed us and our supplies. Sad and curious dark eyes questioned our intentions yet yearned for a smile or a piece of candy. Over that wall is where I first saw Lupe. A mess of strings and curls framed her beautiful brown eyes. Her blue t-shirt was grimy and worn, her tawny skin smudged with dirt. 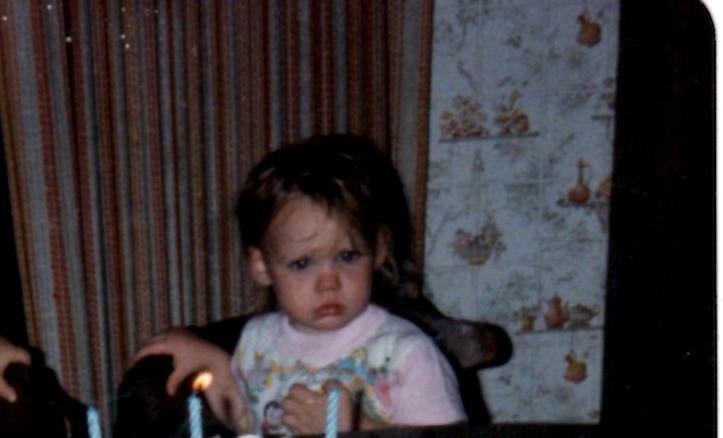 Unlike the other little ones she was wary of my alien presence in her world and would not peer into my surroundings. Instead she sat on the ground playing with a discarded syringe and watched from a distance. The next morning armed with licorice and a warm, wide smile I coaxed her playmates inside the area. Lupe watched and after a few cautious minutes she approached the wall. Folding her small arms, she rested her head upon them and peered over the blocks. Her round eyes betrayed her aloofness. The curiosity and desire for candy and attention was clearly visible. 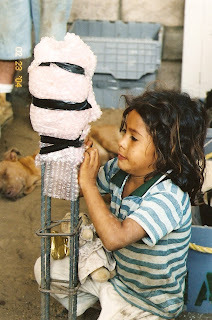 Later that day with a little help from her friends Lupe wandered into my space and heart. But it wasn't the Twizzlers and hugs that made Lupe smile, it was Bubble Wrap. Over the next days with the children playing in our living space the team and I needed to childproof. One of the first precautions we took was to wrap the re-bar. While wrapping the rods with air filled plastic I couldn't resist popping a few bubbles and glanced over to see a troop of young eyes watching with wonder. The widest of them were Lupe's. Bubble Wrap had cracked the code to her world and earned her trust. She sat on the dirt floor happily popping bubbles and before long we were repeating together 'snap, crackle, pop bubble wrap!" The last day in the small village was bittersweet. I was exhausted and ready to return to my own family, but I knew I would miss Lupe as well. I helped to load the supplies and finally it was time to leave. The little clan of miniature Salvadorans came running to say their goodbyes. At the head of the pack was Lupe. She ran straight to me and wrapped her sweet honey arms around my neck. Happy, sad tears filled my eyes. I enfolded her in my love and from behind my back I pulled a small roll of Bubble Wrap, a gift just for her. My missions trip wrote a new chapter in my life. I have gone on from there. I've realized that more than my life or my work, God wrapped His love for Lupe in Bubble Wrap. He used the snap, crackle, pop to make a pocket sized difference in one small life. 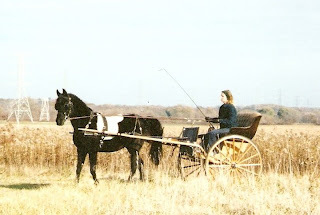 Not so different from another time in a poor, rural stable when He wrapped His love for you and I, not in bubble wrap but in humble swaddling clothes. Unless otherwise noted the material on this blog site is copyright of the author and requires permission to reproduce the contents other than short quotes. If by some slim chance I have impressed you enough that you would like to share something elsewhere, please go to my profile where you will find my email address to request my permission.